There is never an uneventful weekend on the campaign. 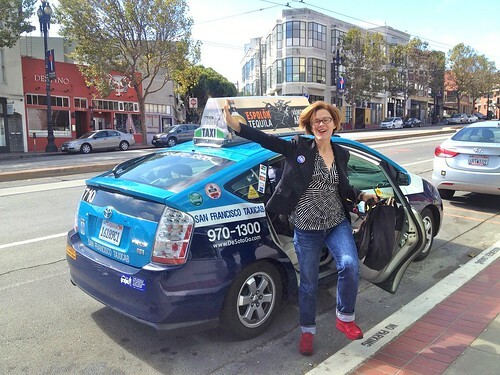 This Saturday we started with an endorsement interview with the National Union of Healthcare Workers in the Tenderloin, after which we broke our car-free campaign streak to jump into a cab (signs and all) and race down to the LGBT Center at 1800 Market for the Harvey Milk LGBT Democratic Club PAC meeting! The PAC meeting, like all other Milk Club events, was a blast. Thea had the chance to talk about her background as a mom, small business owner, and neighborhood activist to an audience of folks who had rolled out of bed and were taking time out of their sunny Saturdays to listen to a whole slew of candidates talk about their races. After putting our ballots in the Big Gay Voting Box and petting a few very cute dogs who had accompanied their owners to the PAC meeting, we hit the streets for our weekend of canvassing. Over Saturday and Sunday we knocked on over 150 doors in lower Pacific Heights, leaving notes and talking to neighbors. It was an exciting two days: we talked to residents of Westside Courts, low-income housing constructed in 1943, several nuns in a Dominican convent on Sutter Street, first-time homeowners, single moms, and many other San Franciscans. It's experiences like these that make Thea so prepared to take the office of Supervisor and serve as a strong voice for all of our district's neighborhoods. We are now 50 days away from election day and have 3 weeks until absentee ballots are mailed out! This is the home stretch, and we need your support. Come walk and knock with us in the sunshine. Meet nuns, pet dogs, pass out flyers. Phone bank, and reach out to your neighbors with Thea's message of grass-roots politics and community representation. Our wonderful volunteer coordinator, Saudia, can be reached at thea.volunteer.coordinator@gmail.com or 415 713 0362. Anything you want to do, you can do for us. NOW IS THE TIME!